The Seeds of Hope Bereavement & Loss Activity Book aims to help children and young people manage feelings of loss and change of all kinds through a wide variety of activities all based in Nature. It is written from personal experience. When our baby, Laura, died and her brother and sister began asking questions about her, I started to look for ways to help me talk to them about death and loss. Nature seemed a good place to start. So much in Nature echoes the changes that happen in life. None of us can live life without change and all change means loss and new beginnings - a pattern repeated over and over in Nature's cycles of life. The activities and illustrations in the book encourage children to get outside and get exploring - and in doing so, to gain an understanding of how loss and change are a natural part of living. Children who might find it helpful may have divorced parents, may be in foster care of have been adopted, may have moved home or school, may have a pet that's died or experienced the death of a relative. Information and suggestions for parents and teachers is included. The book is ideal for parents and carers, teachers, therapists and counsellors to use with children aged 5+ who have suffered any type of loss or are dealing with change or who are bereaved. What Does Dead Mean? is a beautifully illustrated book that guides children gently through 17 of the ‘big’ questions they often ask about death and dying. 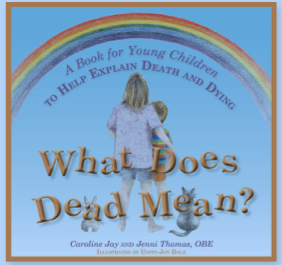 Questions such as ‘Is being dead like sleeping?’, ‘Why do people have to die?’ and ‘Where do dead people go?’ are answered simply, truthfully and clearly to help adults explain to children what happens when someone dies. Prompts encourage children to explore the concepts by talking about, drawing or painting what they think or feel about the questions and answers. Suitable for children aged 4+, this is an ideal book for parents and carers to read with their children, as well as teachers, therapists and counsellors working with young children.